A 6 x 6 square frame. It's well made... nice & smooth, so it will be easy to customize with paint or paper. It has some depth, so it's perfect for a collage with dimension. It's square & square frames are not as easy to find as rectangular ones. The price is great too. SOLD! See how easy?? I had a scrap of watercolor paper laying on the counter in my studio & rather than file it away, I thought I'd take a few minutes to play. This is my first attempt @ the bandanna technique. This started out with the wrinkle free distress technique, developed by Tim. Robin Beam added some details and developed the bandanna technique. This was really fun...but I can see I have a long way to go to perfect it. Click on the link above to read all the juicy details and take some time to play yourself. You'll like it. The flower stamp is from Hero Arts. Happy Saturday! Remember...keep your eyes open!! Family, friends & FUN. That's what makes the holidays so great. Since my brother Paul can not be outdone by Rick and his custom cards, he made me this card. Here's the inside. Check out the lower right corner for the funny part. It says..."Turn over, just incase you think I bought it." Looks like he's been paying attention and you can see that he has quite a sense of humor! Here's a few more tag samples for my Ranger technique class. BEWARE...these guys are very addicting! 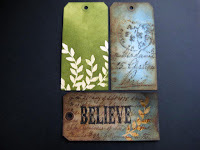 The top right is my favorite from yesterday, using the distress embossing powder. LOVE IT!! I better stick to ART! Geez...I got 3 emails yesterday and another today, inviting me to visit some alpaca farms!! The power of the net... As much as I'd LOVE to...we still haven't won the LOTTO! Here are some sample tags for my January 5th class. This is a new type class for me. It's all techniques. We'll use the Ranger U format & I'll share lots of the cool stuff I learned there. 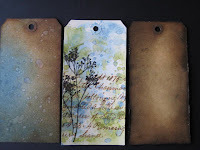 This first class will focus on the Distress Inks, with a sample or 2 of the fun Distress Crackle Paint. Each student will leave with samples and instructions for the techniques they learn. It's really very convenient to have the sample tags with the instructions on a ring, for quick reference on your next play day. I stole that wonderful idea from Tim & Robin. The second class that day will be a wooden box project, using Maya Road's Birds of a Feather, blossoms and scrolls chipboard and the Distress Crackle paint. No photo yet...but I will share once it's done. And...once again, Rick's card ( see the post below from December 24th) gets a comment from tim! Rick is REALLY letting this get to his head. Now he makes suggestions to me. I think I've created a monster! HA! Now this is funny. You'll have to come back tomorrow to see the card my brother made for me for Christmas. He doesn't stamp...but this is just too funny to miss. Tomorrow...be there or be square!! It's worth a laugh! Here's the scoop...I LOVE animals...except Rick's horses. They are too big, I hate flies & the poop is just too big! HA! It's TRUE!! Anyway, about 2 years ago I got the big idea that we should go & visit an alpaca farm & maybe get one. I think they are absolutely adorable and have the cutest sweet faces. I had researched them on the net and knew they were kind of pricey. However, I thought just maybe we could like one for $5000??? This is scarry...the one I fall in love with had a $30,000 price tag!!!!!!!! YIKES!! And how could you possibly bring home only one?? It would be lonely...$60,000??? DOUBLE YIKES...needless to say, they still live at the alpaca farm. But, when we win the LOTTO...I'll be making a purchase or 2! I hope your Christmas was great and wish you all the best in 2008!! May you be creative today!! Or...if you're on the hunt for holiday sale items...GOOD LUCK! Think I'll stay here & make art! Yep...he's a Christmas baby, so we celebrate Christmas on the 24th & his birthday today!! Happy Birthday to the love of my life!! YOU'RE the BEST!! MERRY CHRISTMAS to all our friends. Enjoy the day and 2 of the basic food groups...wine & cookies! ps...Are you wondering what that strange animal is with Rick?? That's a story for another day. Stay tuned!! Ok. This is the card I made for Wendy for Christmas. The pressure was on after we got all the emails about the last one. This isn't as easy as it looks. Believe me. I used a dot stamp and that's supposed to be snowflakes. THANKS for all the comments. You sure made Wendy laugh. MERRY CHRISTMAS to all & especially my wife. Got this in the mail from my friend Cecile ( no link...she doesn't have a blog) yesterday. This is not the best photo, but I hope you can see how cool it is. Her hubby made the wooden holder for the 8 x 10 canvas. 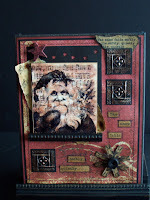 The Santa is done on Stampbord, with alcohol inks as the base coloring. She made the 3 square metal pieces with 10 Seconds Studio tools, a technique we learned @ CHA. She used other techniques that she learned thru the year to complete the piece. I LOVE this & it will be displayed in my studio all year. Also in the goodie box were homemade candies & biscotti. I am assuming these would be low cal, but I'm not sure! I think I forgot to ask! I've got to start the gift wrapping soon. That is my most dreaded Christmas task. Every year I vow to wrap as I buy. Every year, it's the last minute rush to wrap. I think it's because being a paper addict, I find it hard to waste paper! I must think that there will never be more for sale in the stores! NUTS!! Anyway...that's my excuse today! Not long 'til the guy in red shows up. HAPPY HOLIDAYS!! I hope it's THE BEST EVER!! I saw this @ Hobby Lobby & thought it was just perfect for this time of the year. In addition to holiday preparations, we are in pre-CHA mode. So, in simple terms, art is the priority. I am up to my ears in Maya Road goodness and loving every minute. No sneak peeks, but I'm making some way cool things, if I do say so myself. I'll share just as soon as we get the word...I am soooo excited about CHA because I'll have my work displayed in 3 booths!! A DREAM come true!! THANKS to all who sent birthday greetings. I appreciated them ALL!! Rick's posting got 16 posted comments & generated about 40 emails here. Maybe Maya Road got the wrong family member!! He even got a comment from TIM, so now he thinks he's a celebrity! What a guy!! Can't wait to see the Christmas card he makes. Stay tuned...I'm sure he'll HAVE to show you! Get this...on December 12th, I went to JoAnn's. Guess what the sales gals there were doing?? Putting out Valentine's Day things. DECEMBER 12th!!!!!! GEEZZZZZZZZZ...I still need to pick up a few more things for Christmas & wrap it all.......... YIKES!! And here's a Jerry Seinfeldism...how is it that there happens to be just enough news everyday to EXACTLY fill the newspaper pages??? HA! And this is guaranteed to make you smile...go & visit cooper...what a cutie! I'm off to make spaghetti! Gotta have energy to CREATE!! and I'm hijacking Wendy's blog to show you the card I made for her. Look out Tim...you got competition! She thinks that I have class because I chose a Stampers Anonymous stamp....ha!! This cards was made with leftovers! I originally stamped these pieces for other things and then didn't need them. I almost trashed them when I was cleaning up, until I saw that they looked OK together. Just 4 stamps, vintage photo & the T is stamped on My Minds Eye paper. It's kind of an odd shaped card, but I liked it. In Tim's words..."it is what it is". 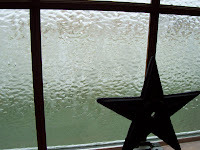 Freezing rain & sleet here last night, continuing today and another day with NO SUN. I'm counting the days 'til spring. Hope your Sunday is PEFFECT! Happy Holidays and back to ART! Who says Christmas cards HAVE to be red & green?? 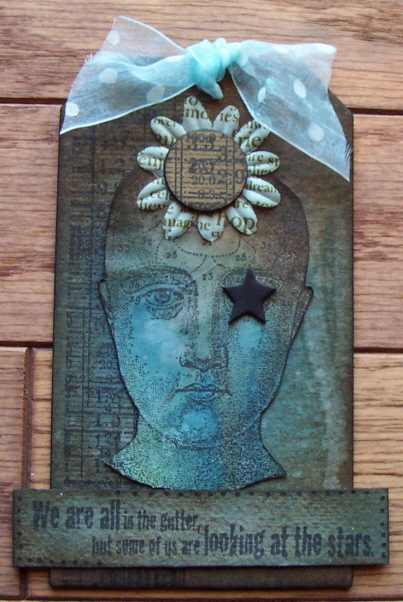 This is a card I made a bit ago & sent off to Ted, who owns Stampers Anonymous. Sucking up is what it's called!! Anyway, I had fun & I used 11 stamps on this one. I think that's my record for the most stamps used on one card! Now, remember the $$ you SAVED yesterday?? You'll NEED it today to get some of these stamps! See how this works??? edited about 10am ...I guess I should do better with giving you stamp info. I got several emails wondering where the large 25 is from. I cut it from the DATE BORDER stamp & that number is G3-1031. I'll try to get a photo of that stamp loaded a little later. Here are my tips of the day! 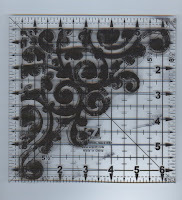 Instead of buying the large acrylic blocks that are used for cling & acrylic stamps, visit JoAnn's, use a coupon & get these quilters squares. The name brand giant size blocks that I've seen, sell for between $16 & $20. YIKES! This 6 inch square sells for $3 after the coupon. The advantages?? The grid lines for easy placement of stamps. It's sooo easy to line up alphabets or multiples on them. Then, when your stamps are perfectly aligned, use the grid lines on your card edge for a perfectly straight image every time. JoAnn's sells 2 brands & the only difference is the color of the lines & the price. This one is called EASY SQUARE JUNIOR. The other is Omnigrid & is double the price. So...save $$ on the acrylic...more $$$ for chipboard & stamps!! That's how it works in my mind...agree?? And another recent shopping find. Beacon's FELT glue. It's a GREAT product. I got it @ Michael's for $3. It does not seep into the fabric & holds really well. 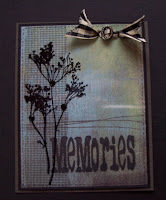 I used some yesterday on Maya Road Ric Rac , felt & the Velvet blossoms & I LOVED it! And the final thought..Obviously I'm a slow learner. We wasted 3 hours last night watching the BEARS look like fools AGAIN! Oh well...I'll survive....I still have my STAMPS!! ps...edited...to answer several emails asking about Maya Road & why there have been no photos. SORRY!! Top secret stuff. I've been working away at least 10 hours a day making MR samples for CHA, but...no sneak peeks are allowed...I'd be fired! Just as soon as I get the OK, I'll post them here. My guess is early February or possibly late January. Thanks for asking! WAYYYYY cool stuff is coming...............HA! Just the basics...one stamp, black ink, black cardstock & white cardstock. 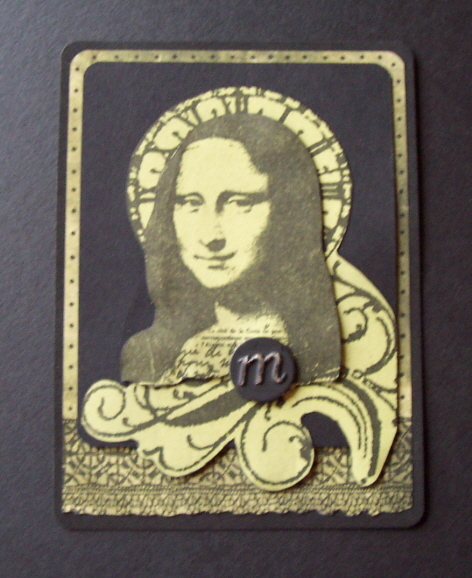 A little layering is all the embellishing this card needs. 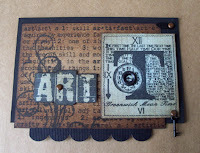 This stamp has so many fun elements and that makes it very versatile. Sometimes all you need is a small finishing touch to MAKE your art. Remember...look @ all your stamps for that special little detail. And this final thought...IF I survive the BEARS game tonight, I'll be back tomorrow with a fun money saving stamping tip! it's dangerous living in Illinois in the winter. Poor Rick had to get a ladder & scrape the snow off the satellite dish. NOT FUN, but how can we survive without the internet? All my friends live in my computer! Anyway...4 stamps used on this card. 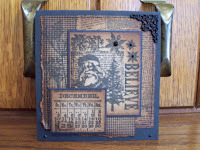 The houndstooth stamp that I used as a border yesterday is used to make the raised round embellishments on this card. No Christmas shopping today..boohoo...guess I'll make art! This is very easy and I think that it makes an effective sympathy card. The dried flowers are stamped on a transparency, which gives this simple card a little bit of dimension. It also explains the glare on the right side of the card. All 3 stamps are Stampers Anonymous & the background paper is Basic Grey. That's it for today...off to the studio for some Maya Road work...actually...it's PLAY! STAY WARM....well everyone except lucky Rachel. She's already warm in Australia! PS...THANK YOU MR BLOGGER!! It's fixed!! Now you can quickly click & see the photos larger. COOL!! HA! I could have said GENDER...but I thought the shock value would be good on Monday! 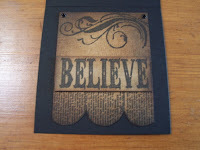 Start with a chipboard tag, add vintage photo & faded jeans...give it a blast with a water filled mini mister, dry with a heat tool & the background is done. 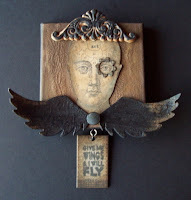 Use 3 stamps, layer, embellish & done! The flower center is a stamped chipboard circle from the foundations tin. Somedays I'm easily amused. I like to see how many stamps I can incorporate onto a single simple card. This one uses 4. Tim's clock was a perfect fit to use as a halo for Mona. I LOVE it when things work as planned. For a real treat, make sure you visit tim's blog. WONDERFUL eyecandy & REALLY good giveaways!! He is amazing! Blogger has me baffled. Some folks can click on the photos to enlarge them & others get a screen to open the file to see them. I've visited some friends blogspot blogs & I'm not able to click on them either. Drives me crazy!! So...if some kind soul comes up with a solution here...I'll give them a nice package of goodies!!! That's a PROMISE! Here's a lovely photo...NOT!! 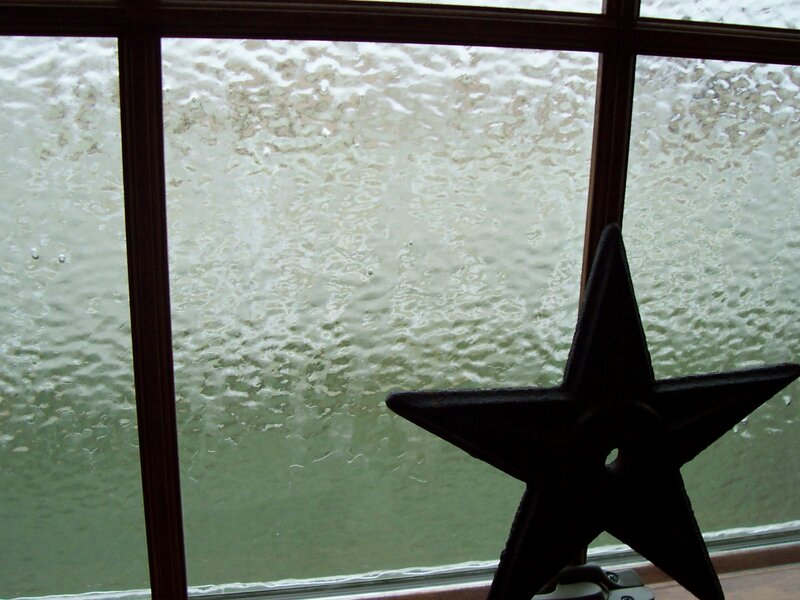 This was the view yesterday from my studio windows and actually every window in the house. But wait...there is NO VIEW!!! Ice everywhere. Winter in Illinois is NOT fun! Rachel dared me to open a window for 5 seconds & take a photo for her. NEVER! HA! My neice was born 25 years ago today & believe it or not, the temperature was 90 degrees. 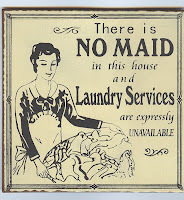 Thought I'd throw in a little random tid-bit! Bears game today @ 3:15, so I'll be working on my Maya Road CHA projects 'til then. Have a good Sunday & MAKE ART...or shop! 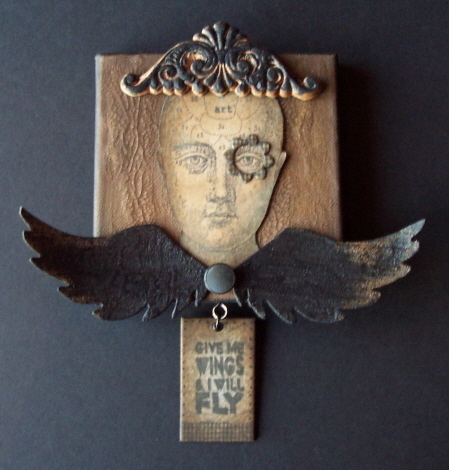 Like the song says...These are a few of my FAVORITE things..
Actually...these are ALL of my favorite things combined on one project...Distress crackle paint in vintage photo, grungeboard wings with black soot crackle paint & a sprinkle of vintage photo distress embossing powder, the phrenology and wings stamps, and a microchip (over the eye) from Maya Road. This photo shows the wings a little better. 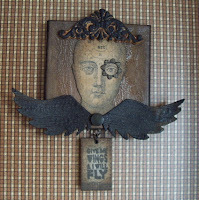 The base is a 5 x 5 canvas, which is perfect for the crackle paint. The headgear is just a wood trim piece. 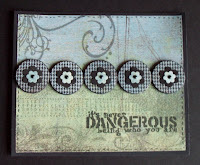 OOPS, I almost forgot another favorite stamp that gets tons of use...the houndstooth border stamp. 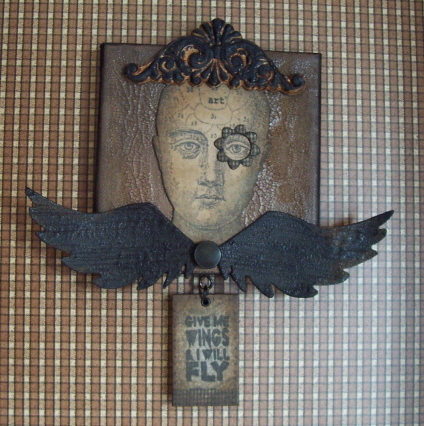 I used it on the microchip and as a border for the hanging piece (foundations chipboard). And to answer the emails I got about yesterdays posting...I have no clue why the image is not clickable to enlarge it. SORRY! Besides being a bad photographer, I'm almost computer illiterate. I got my Maya Road DT assignments for CHA last night, so I'll be really busy making lots of projects for the booth. No showing of the new products or projects is allowed...so........SUFFER!!! HA! I will tell you, there are some REALLY cool new things coming, but MUM'S the word here! I'm sworn to secrecy! It's December 1st........LET THE SHOPPING BEGIN!!!!! Have a very fun weekend. EDITED...GRRRRRRR...these aren't clickable either. I have no clue what's different here. I'll TRY my best to get this changed. SORRY again! !